This recipe won Post of the Day for 1/29/10! As promised, the third of three tasty recipes in 24 hours! 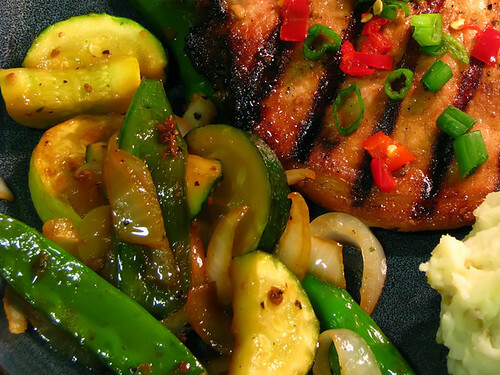 Just your basic sauteed vegetables … with an Asian angle. 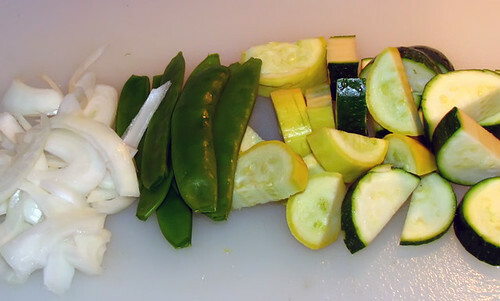 Rinse and drain all veggies. Mince garlic, set aside. Chop squash into 1/4″-1/2″ semi-circles, trim any stems off of the snow peas, cut onions into 1″-2″ long 1/4″-1/2″ strips, set aside. 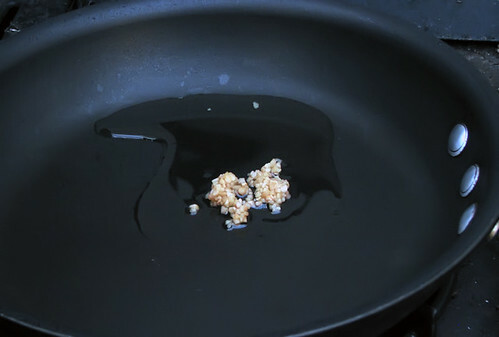 Place non-stick skillet over medium-high flame, heat oil. Sautee garlic for about a minute. Add squash and saute for one minute. Add onions, salt and pepper to taste, and continue to cook until onions turn translucent. 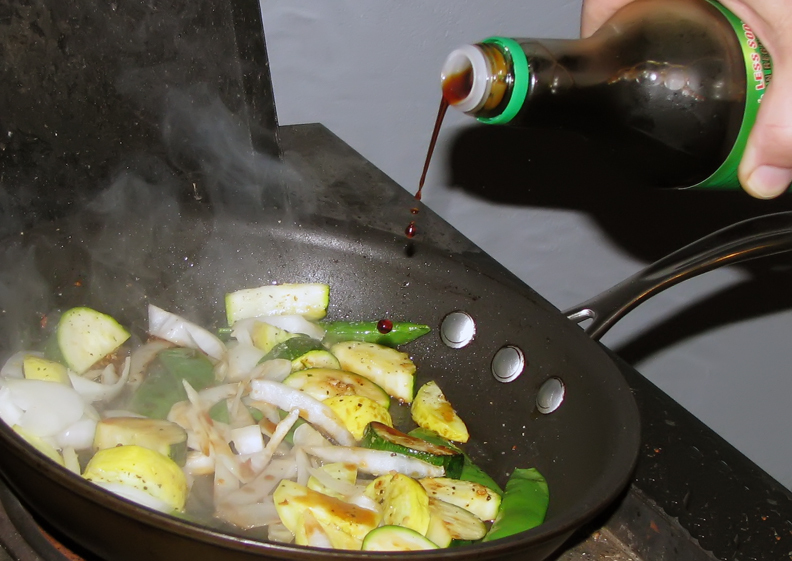 Add soy sauce to taste, continue to saute until all ingredients are covered with soy sauce. Remove from heat and serve with any Asian-influenced dish. Pictured here with Korean Pork Chops (Daeji Galbi) and Garlic Mashed Potatoes. This entry was posted on January 29, 2010 at 8:40 PM	and is filed under Asian, Side Dishes, Vegetables, Vegetarian. Tagged: cooking, food, garlic, onion, skillet, snow peas, squash. You can follow any responses to this entry through the RSS 2.0 feed. You can leave a response, or trackback from your own site. Looks delicious and healthy. 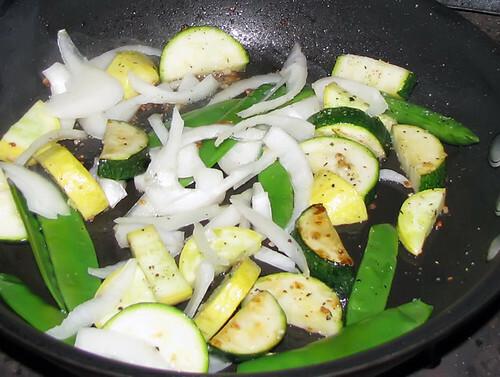 Stir fried vegetables are always my favourite. My family loves them. What a tasty stir-fry! Sounds delicious alongside the chops and garlic mash! I bet it would be good over rice too. Thanks, Reeni! I just couldn’t ignore the Cavekids’ pleas for garlic-mashed taters, otherwise it would have been steamed rice next to the chops and veggies. But, the potatoes worked surprisingly well. Congrats, on Foodblogs top post! Must be the fruit of your penance! Wow! What a pic with pouring the soy sauce, thumbs up! BTW finally the Honest Award post is out! I know a bit late but we had to concert and I had net problems. Not very nice! Thank you, Viviane! The Cavewoman caught that shot … she rocks the lens!! Can’t wait to read the post … going there now! Simple, quick, delicious, healthy and nice to look at– I think you’ve covered all the bases with this one! Many thanks for this great looking recipe which is right up my alley. And the third in 24 hours? That Herculean effort makes me feel like the worst sort of food blogging sloth. Kudos also your excellent writing throughout this site. Love stir fry, great color!! I’ve been looking all over the internet for something like this! And, you just made mine, Emilie. Thanks! I love having a mix of veggies as a side with dinner! This seems like a great sauce to have them with. Thanks, Joanne! These do rock … even the Cavekids love ’em! !